This occupies the major part of the Park and is of two types, namely the Tropical Moist Deciduous and Tropical Dry Deciduous types. The Tropical Moist Deciduous type is represented by the dominant the species, Shorea robusta, which forms pure tracts. 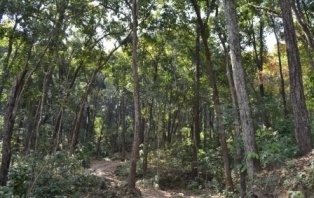 The common associates of the Sal forest are Terminalia alata, Anogeissus latifolia, Adina (Haldina) cordifolia, Terminalia bellerica, Lannea coromandelica, Garuga pinnata, Stereospermum suaveolens, Ougeinia dalbergioides, Cassia fistula, Bridelea retusa, Lagerstroemia parviflora, Schleichera oleosa, Semecarprs anacardium, Buchanania Lanzan, Careya arborea, Mallotus Philippensis, etc. The middle storey consists chiefly of species such as Aegle marmelos, Ehretia laevis, Emblica officinalis, Cassia fistula, Syzygium cumini, Holarrhena antidysenterica, diospyros spp., Kydia calycina and Bauhinia variegate. The forest undergrowth is composed of Ardisia solanacea, Flemingia strobilifera, F.chappar, Carissa opaca, Callicarpa macrophylla, Murraya koenigii, Colebrookea oppositifolia, Glycosmis pentaphylla, Clerodendron viscosum, Adhatoda zeylanica, Pogostemon benghalense, Desmodium gangeticum, D. pulchellum, Woodfordia fruticosa, Indigofera cassioides, Leea crispa, etc. The ground flora consists of Adenostema malavenia, Curculigo orchioides, Uraria picta, U. lagopus, Acrocephalus indicus, Blumea aromatic, Ageratum conyzoides, Cyperus spp., Polygonum spp., Sida spp., Aerva sanguinolenta, Solanum nigrum, Vernonia cinerea, Ajuga bracteosa, Hemigraphis hirta, Hackelochloa granularis, Opliasmenus compositus, O. burmanii, Cyrtococcum patens, Hibiscus lobatus, Crotalaria sericia, Sericia, Siegesbeckia orientalis, Urenalobata, Cynoglossum lanceolatum, Biophytum sensitivum, etc. The common climbers found in the forest are Acacia pennata, Caesalpinia bonduc, Hiptage benghalensis, #Clematis gouriana, #Vallaris solanacea, #Capparis zeylanica, #Tinospora cordifolia, Aspidopteris wallichii, #porana paniculata, #Smilax spp., #Bauhinia vahlii, #Ventilago denticulate, Ziszyphus oenoplia, #Pueraria tuberose, Milletia extensa, #Abrus precatorius, #Ichnocarpus frutescens, #Celastrus paniculatus, #Ampelocissus latifolia, #Cissampelos pariera, #Butea parviflora, #Dioscorea belophylla, D.bulbifera, #Coccinia grandis, #Cryptolepis buchanani, #Combretum decandrum, #Scindapsus officinalis, etc.